With Bismarck’s rich history and position as a major economic and government hub, there are plenty of fun things to see and do in the Bismarck-Mandan area. With Bismarck’s central location, it allows easy access to nearly every fun activity within the state. The Bismarck Event Center hosts everything from circuses and exhibits to sporting events and concerts. Located next to Kirkwood Mall. Bismarck is home to numerous parks for recreation. Some of the largest include Hillside (AKA Lions), Pioneer, Sertoma, and General Sibley. Sertoma Park sits on the banks of the Missouri River, and is home to the Dakota Zoo and Superslide Amusement Park. Historic frontier town home to several original frontier buildings. Contains the oldest surviving building in Bismarck, built in 1872 as an infantry post and warehouse. Site also contains a vintage 1909 Northern Pacific train locomotive and the Bread of Life Church, built in 1881. Located near downtown. First opened in 1961, the Dakota Zoo is home to many different species of animals, and was once home to the world’s largest Kodiak bear in captivity. Located on the banks of Missouri River adjacent to Sertoma Park. Features many historic buildings dating as far back as the 1880s. Downtown Bismarck was once the region’s main business hub, with both national and local retailers competing successfully for many decades. Recent renaissance projects have pumped new life into downtown, with many retailers and restaurants again located in the district. Among the most notable historic buildings include the Patterson Hotel (1911), Federal Building (1913), Webb Brothers Block (1900), Civic Square (1912), Dakota Block (1883), and Anderson Building (1905). The Provident Building and its weather beacon is also located downtown, along with other unique structures. The enchanted highway is home to many fabulous metal sculptures produced by Regent native Gary Greff. Regent is about a two-hour drive from the Bismarck-Mandan area. North Dakota has many options for fishing, boating, and related water activities. The Bismarck-Mandan area alone has several options, including the Missouri River and man-made McDowell Dam. Formed by the Garrison Dam, Lake Sakakawea is the largest lake in the state, and the third largest man-made lake in the nation. Lake Sakakawea is located about 50 miles northwest of Bismarck. Established to serve and protect the expanding railroad and represent military interests through Dakota Territory, Fort Abraham Lincoln State Park also includes the On a Slant Indian Village. Here is the site where George Armstrong Custer began his trek to the infamous Battle of Little Bighorn. A recreation of Custer’s House, earthlodges, blockhouses, and other buildings remaining from the military post can be toured. There are several golf courses in the Bismarck-Mandan area, including Pebble Creek, Tom O’leary, Riverside, Prairie West, Apple Creek, Mandan Municipal, and Hawktree. 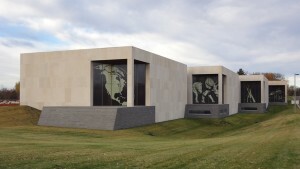 Completed in 1981, the North Dakota Heritage Center sits on the grounds of the state capitol. The Heritage Center is home to numerous exhibits that take visitors through North Dakota’s rich history. The Lewis & Clark Riverboat cruises the Missouri River every summer night, weather permitting. It’s available for individuals and also large groups. A bar is on-board, and meals can also be purchased. The Mandan Community Center has convention rooms available, along with a large indoor swimming complex, complete with an indoor waterslide. Two major movie theaters serve Bismarck-Mandan, Grand Theatre and AMC 8 Classic Cinema (formerly Midco/Carmike). Built in 1934, the art-deco “Skyscraper on the Prairie” is the tallest building in North Dakota at 19 stories. The grounds are filled with walking paths, several different species of plants, a veteran’s memorial, and various statues. Community gatherings are common occurrences at the capitol mall, including a July 4th fireworks display. The heritage center is also located on the grounds of the capitol. Prairie Knights Casino & Resort is located 46 miles south of Mandan and is one of North Dakota’s largest casinos, with 600 slot machines, blackjack, and other games. Salem Sue, located about 34 miles west of Bismarck, is the world’s largest cow. Built in 1974, Salem Sue stands 38 feet and is the tallest of the famous North Dakota animal statues. Bismarck is the largest retail hub in central and western North Dakota, second only to Fargo in the state. The area boasts a diverse mix of local, regional, and national outlets, along with several shopping districts, most notably Kirkwood Mall, Gateway Fashion Mall, Pinehurst Square, Hay Creek Shops, and downtown Bismarck. Opened in 1993, Huff Hills is North Dakota’s largest ski area, home to sixteen runs and four lifts. The main building also has full food service, serving everything from chili to pizza. Bismarck-Mandan has several options to cool off by the pool. The first public outdoor pool opened in Bismarck was Elks, followed by Hillside, then the Wachter Wave Pool. YMCA has a location in Bismarck with two indoor pools, and the Mandan Community Center also has an indoor water facility. Raging Rivers Waterpark in Mandan is North Dakota’s largest waterpark. North Dakota is also home to the world’s largest buffalo, located about 102 miles east of Bismarck in Jamestown. Standing 26 feet tall, the buffalo was erected in 1959. Located next to the famous buffalo is also the Frontier Village, where tourists can tour an old pioneer village, complete with a post office, jail, barber shop, and other great buildings.